Insulating is great; however, you could have energy efficiency issues with your air ducts. Sealing your air ducts can help to make your system more efficient. I read a summary of a study done about the state of energy efficency in our homes. Most Americans want more efficient homes, because they want to reduce their energy bills. Most of us do one thing towards this goal, maybe two. We insulate; we caulk, sealing air gaps. Our bills see minor improvement, so we think this energy efficiency kick might not be worth it. If we are trying, we go for one more effort to reduce our electric bill: compact flourescent lighting. Sounds great. The electric bill still does not see much improvement. The study found to significantly reduce our bills that we need to do four things towards energy efficiency. I might suggest that youseal your air ducts. 1)I measure the size of the duct diameter. A flexible tape measure such as used by tailors works well. You can take a piece of string. Wrap it around the duct, marking the diameter. 2) While the radiant barrier is still in its original roll, I measure out the length of the duct, with an additional three to four inches for overlap. I cut the material with a handsaw. 3) I unroll the radiant barrier to wrap it around the duct. Here is the hard part. 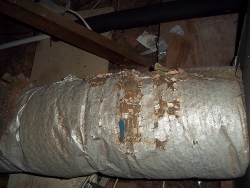 Your duct should be supported by straps, so the duct does not sit on the insulation. Lifting the duct up to slide the new sheathing through is not always an easy task, particularly in a tight fitting attic. I wrap around the straps. I cut slits into the sheathing material to fit the barrier on each side of the strap. I then use HVAC tape to tape up any openings. The overlap is pulled tight, and I tape the overlap with HVAC tape. Why HVAC tape and not duct tape. HVAC stands for heating, ventilation, and air conditioning, and having the right material for the job ensures a better job. I am not sure why, but I have seen duct tape peeling off from ducts and plenums when used in this application. 4) The ducts obtain their conditioned air from the supply plenum. This is the big box after the evaporator coil (the metal box with a safety pan to catch water underneath it). Use the tape to seal the new sheathing to the plenum. If the plenum has leaks, you can use the radiant barrier as a new sheathing for this part of the system too. Remember to seal with HVAC tape. 5) The last step is often skipped when I find that ducts have been sealed during my home inspections. The duct attaches to a box for the vent into your room, called a register. The box will probably need a new sheathing or at least sealing with tape. When energy was cheap, builders and homeowners were not concerned if ducts had little insulation, or if there sealing was not entirely complete. If there were no obvious signs of problems, then they did not seal tightly. The radiant barrier does act like an insulation. Most new homes have ducts with insulation that has a R-6 value. That is basic. A value of R-8 is better, and you can find this amount in new homes. The radiant barrier adds about this amount. In a climate like Houston, you may wish to go a bit higher in insulating value. You could add more insulation over the Radiant barrier if you want to go a little better. This would also have to be taped with the HVAC tape. My attic is a tight fit in several places, and this poses my greatest challenge. However, leaving the ducts unsealed is noticeable. Of the air ducts which I have sealed, I find the temperature coming out of the duct is hotter during heating months, and the temperature is cooler during the cooling months. I did not think that I had much of a sealing problem. I felt the problem in my case was poor insulation. What I discovered was that older ducts which may appear to be sealed well still need help. This entry was posted on Wednesday, December 7th, 2011 at 2:30 pm	and is filed under Green home conversion. You can follow any responses to this entry through the RSS 2.0 feed.